By H. E. John C.M Groffen, Ambassador of the Kingdom of the Netherlands to Nigeria in this interview with our West Africa Editor, Sunday Oyinloye. Photography by Adenike Adesina. Ambassador Groffen speaks on the economic relations between his county and Nigeria and other issues. How would you describe your experience in Nigeria compared to other countries you have served? Nigeria is a special country I must say. I have worked in several countries but Nigeria has a lot of potentials. Though, the challenges of security and unemployment are there, sky is the limit if Nigeria utilizes her full potentials. If the right policies are put in place, there will be no limit to what Nigeria will be able to achieve as a nation and the country will be the real giant of Africa. From your perspective, what are those things that make Nigeria stands out from other African nations? That is difficult for me to say. This is because Nigeria is the only African country that I know. However, the population of Nigeria makes it a good place for Dutch investors. The country has a huge population, about 170miilion people which makes it a good market. Like I said earlier, Nigeria is the only country in Africa that I know very well. 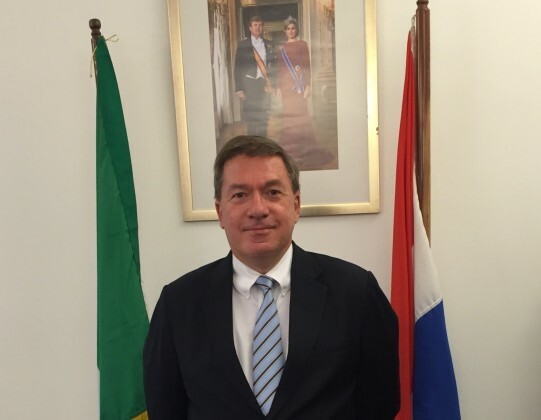 H.E John C.M Groffen, Dutch Ambassador to Nigeria. What levels of economic relations exist between Nigeria and the Netherlands? We have good long standing economic relations. Our relations predate Nigeria’s independence. We have seen good and bad times together, there are many Dutch companies doing well in Nigeria, Shell, Phillips ,Friesland, Campina and a host of other Dutch companies. We are also encouraging Dutch investors in small and medium scale businesses especially in the area of agriculture through value chain. The former Minister of Agriculture, Dr. Adesina did well in the area of value chain which we believe in. We are ready to partner with Nigeria in its bid to diversify its economy. Remember that the Netherlands is the second largest exporter of agricultural products in the world, so Nigeria has a lot to learn from our country. Netherlands is one of the biggest trade partners of Nigeria, what is your country doing to sustain this? We are the most important trade partner of Nigeria in Europe. Export of crude oil to the Netherlands and refined products back to Nigeria constitute the bulk of these trade relations. Now, we want to pay more attention to Agriculture because it is a sector which can create employment opportunities for Nigerians. Nigeria spends billions of dollars on importation of wheat, rice and other food items yearly, but that can be improved upon if more attention is paid to agriculture. If you develop your agricultural sector, you can begin to talk about exportation. But let me say that we are in the process of signing Economic Partnership Agreement (EPA) so that Nigeria will have more access to the Netherlands market. Nigeria should drive agricultural transformation. We want to encourage Nigeria. Nigeria rely too much on imported goods from Europe and Asia, China in particular, should Nigerians expect more Dutch manufacturing companies in the nearest future? We know that Nigeria is the largest market in Africa, but Nigeria is not seen in the outside world as an easy market where investors can grow their businesses. Before some major policies are made, investors in those areas ought to be informed well ahead for their own planning. A typical investor would want to put his money where there is a measure of predictability. Government has to create an environment that will make would-be investors to be able to plan. Let me give you some examples, the Petroleum Industry Bill (PIB) which is a good idea has been in the National Assembly for some years. International oil companies are not sure of what is going to happen to the bill. So if they are not sure of what is going to happen to the bill, they will probably not invest in the economy. Again, the Central Bank of Nigeria recently excluded 41 products from the list of items valid for forex in the Nigerian Stock Exchange Market without prior notice. It was a sudden measure by the Central Bank. What is the Netherlands doing to assist Nigeria in combating her security challenges? Let me say that crime has to do with socio-economic circumstances. Sometimes people are forced to do those things because of unemployment. So, more jobs should be provided to bring down the crime rate. Nigeria has vast growing population; therefore, government has to work hard on the economy to provide jobs for the growing population. Nigeria’s economy must be made to stand out. On the issue of Boko Haram, government has to look at its root cause. The Netherlands is partnering with Nigeria to tackle the problem using the soft approach, for instance how to de-radicalise those who believe in the principle of Boko Hram and also in the area of education and other soft approaches. Many Nigerians have criticized your country for closing its consular for those travelling to the Netherlands on short visits, now they have to go through Belgium Embassy in Abuja or France Embassy in Lagos. What informed that decision and should Nigerians expect a reversal of the system? The decision was taken before my arrival here. But let me say that the criteria for obtaining visa in most E U countries are the same. In principle, it should not make any difference where you apply from. The new system saves money. Then, as France and Belgium issue Schengen visas on our behalf in Nigeria, we also do same for them in other countries. However, I want to advice Nigerians to always apply for their visas on time.